The application of novel meat sources to the production of traditional smoked premium ham was evaluated. Various feeding strategies were designed for 90 Duroc x (Duroc x Landrace) pigs. The experiment was conducted to investigate the effects on the quality of meat and smoked ham when supplementing the diet of slaughter pigs with linseed oil and rapeseed oil and with the addition of vitamin E. Proximate composition, pH, texture and colour parameters of the quadriceps femoris muscles (raw pork and pork ham) were determined. The multivariate analysis of these traits demonstrated that the 3% addition of linseed oil to pigs' diet caused a decrease in the fat content in meat, and in higher meat tenderness and protein content. 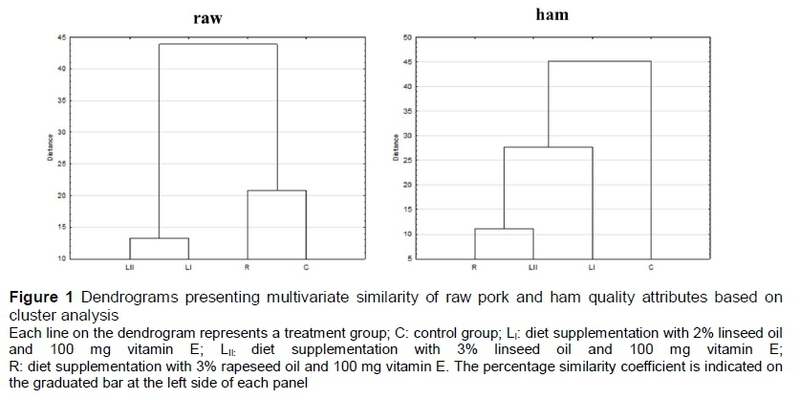 Diet supplementation with 3% linseed oil caused a significant increase in the technological yield of ham production (20.3%), but only in products with high fat content (8.30%). Data allowed the authors to conclude that diet supplementation with 3% linseed oil, coupled with 100 mg vitamin E, is the best form of supplementing a diet for fatteners that are reared in compliance with the rigorous principles of the pork quality system. Between 2006 and 2050, the global human population is estimated to increase by 37% (United Nations, 2007). This will necessitate a food production increase. In 2050, the global production of pork meat is estimated to exceed 465 million tons, which is twice as much as that produced in 1999 (Steinfeld et al., 2006). Today, the possibility that these predictions will come true is exceptionally high because pork represents 49% of total consumed meat, and 70% of meat products in Europe (European Commission, 2013). Such a high increase in meat production compared with previous years is the result of strong intensification of production and reduced costs of animal rearing. An increase in pig population, however, is not linked to a higher number of farms being involved in pig production, but to the boosted production of pork by leading producers from China and Denmark. Today, consumers pay increasing attention to meat quality, animal welfare and the impact of mass production on the environment. It is therefore important to increase production effectiveness and to modernize technological systems. Several research studies have proved that the quality of pork depends on the choice of an appropriate genotype of animal and conditions of feeding and rearing (Bosi & Russo, 2004; Ventura et al., 2012; Okrouhla et al., 2013; Zhou et al., 2014; Bordevic et al., 2016). One of the most effective methods of modernized animal production is to introduce quality systems involving the producer, the processor, the salesperson and the consumer. 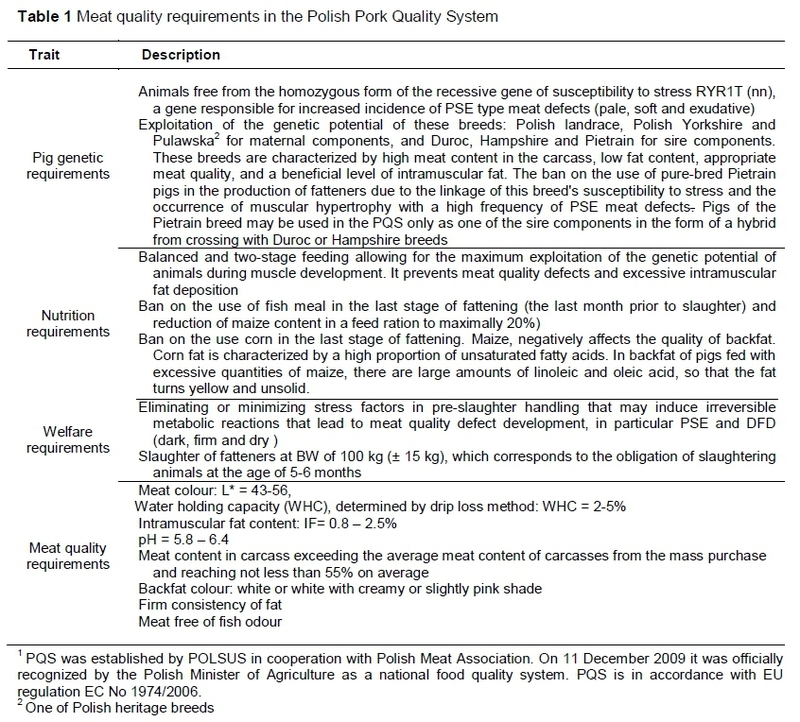 For example, the Pork Quality Assurance Plus® (PQA Plus) system was implemented in the US in 2007 (National Pork Board, 2010), and the Pork Quality System® (PQS) was implemented two years later (11 December 2009) in Poland (Guzek et al., 2013). Of course, rigorous obedience to PQS principles is a prerequisite to obtaining a production certificate, but it does not prevent a producer from enacting successive improvements of these principles and pursuing even better results, as well as a higher quality of manufactured product and greater safety. The most popular food product from pork is ham (Jimenez-Colmenero et al., 2010). The processing includes smoking and scalding, which prolong its shelf life. The manufacturing of smoked meat products has a long-established tradition in Europe. There are many types of these products, and they are manufactured on a commercial scale in the division of high-value food products (Resano et al., 2007). Scalded and smoked meat products are usually manufactured in a traditional way from the whole hind leg or from separated muscles with fat and skin, and with such basic ingredients as rock salt and water. Then they are smoked with the wood of deciduous trees. The modern processing is based on strict parameters of time, temperature, humidity, with the addition of osmotically active and flavour-enhancing substances (Feng et al., 2013). The quality of smoked pork products is influenced by many factors, of which the most important are the quality of the raw materials and the processing, which must be conducted appropriately (Jimenez-Colmenero et al., 2010). The content and quality of fat are determinants of the final sensory characteristics of ham, namely flavour, texture, juiciness and appearance (Safa et al., 2017). Today, producers tend to manufacture food products with increased nutritional value and all the necessary properties of functional foods. 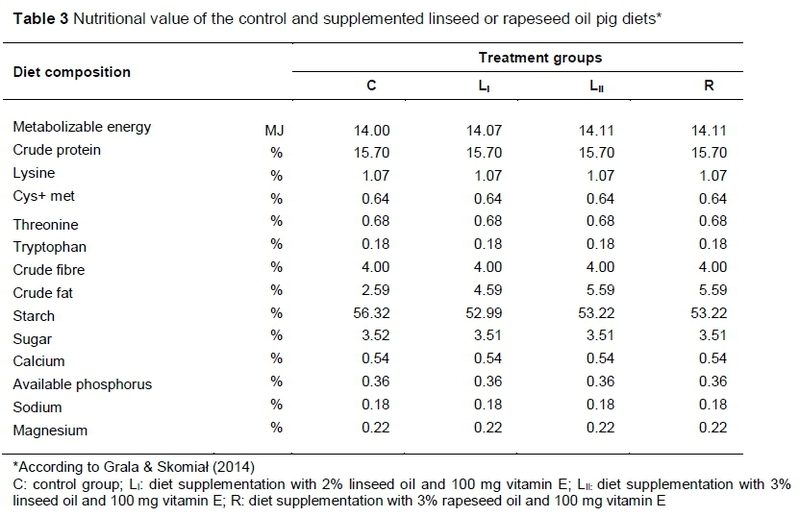 The use of linseed oil and rapeseed oil, coupled with vitamin E supplementation, as feed additives, which improve the quality of meat from fatteners, resulted from long-lasting studies that show their undeniably positive effects on, primarily, the texture, lipid profile and oxidative properties of pork (Matthews et al., 2000; D'Arrigo et al., 2002; Musella et al., 2009; Kralik et al., 2010; WiQcek et al., 2010, Horbahczuk et al., 2015). Data from literature point to the significant effect of raw material properties, (particularly the content of intramuscular fat) and processing (i.e. duration of brining and pickling) on the quality of long-ripening smoked meat products (Cila et al., 2006). For scalded smoked meat products, however, a need has emerged for extensive research. This study therefore focused on the analysis of the effects of modification of pig diet in compliance with PQS standards through the addition of vitamin E and linseed (l_iand LII) or rapeseed oil (R) on the proximate composition, colour and texture (firmness and tenderness) of the quadriceps femoris muscle and of scalded smoked ham made from it. Pig diet supplementation, coupled with rigorous compliance with PQS standards for livestock production, will provide an opportunity to create new functional meat products of the highest possible quality. The experiment was conducted on pig production farms in Wronie, Kujawsko-Pomorskie Province, Poland. The pigs were in commercial production following PQS standards. According to Directive 2003/65/EC of the European Parliament and of the Council of 22 July 2003 amending Council Directive 86/609/EEC on the approximation of laws, regulations and administrative provisions of the Member States regarding the protection of animals used for experimental and other scientific purposes (Text with EEA relevance) (Directive 65/EC, 2003). The production was not an experimental procedure and did not require application to and consent of the National Ethical Commission at the Ministry of Science and Higher Education in Poland. A total of 360 pig hybrids (Duroc x (Duroc x Landrace) were reared in compliance with PQS standards, which are presented in Table 1. Hogs, aged 10 weeks (70 ± 2 days) (after weaning) and meeting the weight criterion (30 ± 2.0 kg), were randomly assigned to four dietary treatments. Each experimental group consisted of 90 animals (six replicates of 15 animals each). They were kept on straw litter in pens with a stocking density of 1 m2/pig. The pens were equipped with objects that attracted attention and prevented aggression, for example hanging chains and balls. At the first stage of fattening, which is until pigs have reached 50 kg live weight (50 ± 2.5 kg; 79 ± 2 days old), all porkers were fed ad libitum the same feed mixture containing 3400 kcal/kg of digestible energy and 16% crude protein. The second stage of fattening (60 ± 3.5 kg; 95 ± 2 days of old) involved feeding the porkers ad libitum with the experimental feed mixtures, namely the control diet (C); a diet supplemented with 2.0% linseed oil and 100 mg vitamin E a-tocopherol (LI); a diet supplemented with 3.0% linseed oil and 100 mg vitamin E, a-tocopherol (LII); and a diet supplemented with 3.0% rapeseed oil and 100 mg vitamin E, a-tocopherol (100 mg vitamin E = 100 IU = 100 mg equivalent ethyl a-tocopherol) (R) (Tables 2 and 3). The body weight of individual fatteners was measured (50 ± 2.5 kg) before the onset of the first stage of fattening to select animals with bodyweights within a specified range, at the start of the second stage of fattening and at the end of the experiment. Feed intake (kg/pig per day) was controlled in each group by weighing the administered feed and subtracting the leftovers. The results of feed intake determination and bodyweight measurements allowed the feed conversion ratio (FCR) (kg feed/kg live weight gain) to be calculated. After five weeks in the second stage of fattening, 12 porkers with body weights ranging from 95 to 105 kg were selected from each experimental group, resulting in two pigs from each replication. The animals were transported at night (120 km, 2 h) to a slaughter house (ZM Olewnik, Sierpc, Poland). They were slaughtered according to the standard procedure under veterinarian control. After evisceration, half-carcasses were cooled with the shock method in counter current until the temperature of the meat reached ca. 4 °C. The quadriceps femoris (QF) muscles were cut from the chilled half-carcasses 12 hours post slaughter, and their weights were measured (1.05 ± 0.1 kg). The muscles sampled from the right half-carcasses were used for a physicochemical analysis of the meat, and those cut from the left half-carcasses, which had similar weight (42.5 ± 0.5 kg) were used to produce Polish traditional smoked ham. The processing of ham production was started by injecting a brine solution of 3% NaCl and 100 ppm NaNO2 using an injector (Injector Universal, Delitech Dagema, Willich, Germany) in 20% of muscle mass. The muscles were then plasticized using a vacuum tumbler (LPM 20, Glass, Paderborn, Germany) for 40 minutes in an interval programme: 50% work time and 50% relaxation, using a cooling system (4 °C) in the working chamber. Next, the products were air-dry smoked for 2.5 hours with beech chips, with fraction sizes ranging from 4.0 to 12.0 mm, with the temperature of the working chamber in the smokehouse reaching 40 °C (UW-150, Borniak, Borne Sulinowo, Polska). The smoked meat was scalded in a convection-vapour furnace (CPE 110, Kuppersbuch, Gelsenkirchen, Germany) at 95 °C with full steaming of the working chamber. The finished meat product was cooled to 2 °C and stored at 0 ± 1 °C. In raw meat, pH measurements were taken 24 hours after slaughter, but in the finished products these were taken after the processing of production was completed on the cooled samples. Analyses were carried out in three replications according to the methodology described by Wyrwisz et al. (2016). Using a pH-meter (205, TESTO, Lenzkirch, Germany), measurements of the pH value were performed at three sites on a slice of ham. A 100 g slice of the sample (muscle or ham) was homogenized in a Buchi B-400 homogenizer. The homogenate was distributed onto a Petri dish and analysed three times with a near-infrared (NIR) spectroscopy in a NIRFlex solids apparatus (N-500, Büchi, Flawil, Switzerland) for contents (%) of water, protein, fat, connective tissue and ash. Instrumental measurement of Warner-Bratzler shear force (WBSF) (N) was conducted using a universal testing machine, Instron (model 5965, MA, USA) with a Warner-Bratzler shear attachment consisting of a v-notch blade, according to Wyrwisz et al. (2016). Six cores (1.27 cm in diameter and 2.5 ± 0.2 cm in length) were obtained from each sample slice parallel to the orientation of the muscle fibre. A 500-N load cell was used, and the crosshead speed was set at 200 mm/min. Colour parameters of raw and smoked FQ muscles were measured at the surface of the muscle cross section, always in the same area, and starting from the head of the muscle. Results of the meat colour analyses were presented in the CIE-L*a*b* scale where the L* value designates lightness, ranging from 0 for black to 100 for white, and a* and b* are colour coordinates (+a*: red, -a*: green, +b*: yellow, -b*: blue) (Commission Internationale de l'Eclairage). The muscle was left to bloom for 30 minutes. Afterwards, 10 measurements of colour value were performed with an illuminant D65, 2° standard observer. The diameter of the measuring head was 8 mm (Minolta Chroma Meter CR-400, Osaka, Japan) on the surface of the freshly cut muscle. Mean values were compared between groups with a one-way analysis of variance and Duncan's multiple comparison test. If assumptions of the variance analysis were not met, owing to a lack of normality of distribution based on the Shapiro-Wilks test or an inequality of variance based on Levene's test, means were compared between groups with a Kruskal-Wallis test. Multivariate differences in meat quality were evaluated between groups using a cluster analysis. The analyses were based on squared Euclidean distances for standardized variables, and Ward's method was used for agglomeration. Results were presented in the form of dendrograms. Multivariate differences between groups were also evaluated with a multi-way analysis of variance (MANOVA), and the F-test was based on Wilks' lambda. The statistical analysis was carried out using Statistica 10.0 software (StatSoft, 2011) and SPSS Statistics 23 (IBM, 2015) and assumed values to be significant at P <0.05 or P <0.001 for MANOVA. Table 4 summarizes the results of the meat quality analysis conducted for fatteners produced in the PQS system with diet modifications and of the quality analysis of the finished meat product, smoked ham. 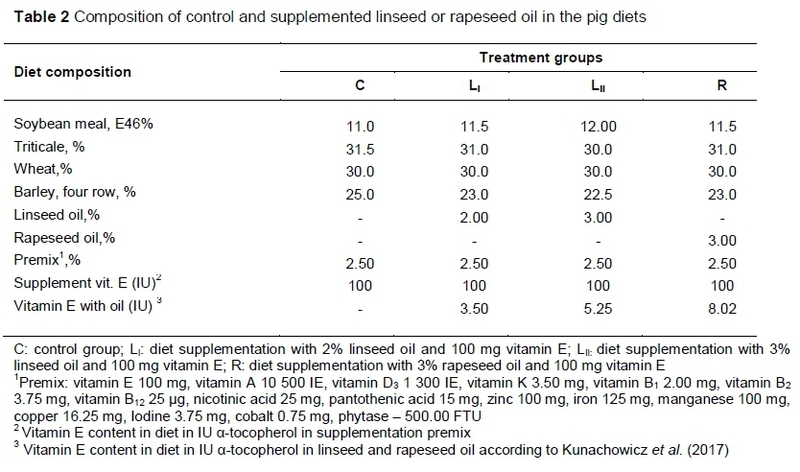 The supplementation of pig diet with linseed oil influenced the pH value of the meat compared with the results obtained for groups C and R. One per cent difference in linseed oil addition did not affect the pH between LI and LII groups. Linseed oil supplementation significantly increased water content and protein in raw meat compared with C and R groups (P <0.05). Of all the analysed groups, the highest tenderness for meat and ham samples was observed in LII. Linseed oil supplementation had no effect on the L* parameter of meat, whereas LII ham was characterized by a higher lightness compared with C. Regarding the saturation level of red a* and yellow b*, supplementation of linseed oil significantly influenced the intensity of the colour of meat compared with C and R groups (P <0.05). In hams, the results for these parameters have decreased. These results are consistent with earlier reports (Okrouhla et al., 2013). Diet supplementation with linseed oil contributed to a significant decrease in fat content of meat (P <0.05). This observation corresponds to results reported earlier by Dostalova et al. (2012), because they demonstrated a significant decrease in the fat content of Pietrain meat, and to findings published by Vaclavkova et al. (2014) regarding the meat of Prestice Black-Pied pigs as a result of diet supplementation with 7% linseed oil. In contrast, Huang et al. (2008) demonstrated an increase in the content of intramuscular fat, but this occurred at significantly higher diet supplementation with linseed oil (10%). In turn, Beckova & Vaclavkova (2010) showed no change in the chemical composition of meat from pigs fed a diet supplemented with linseed oil. Therefore, it may be speculated that the discrepancy of the results obtained in the chemical composition of meat from pigs fed a diet with additional linseed oil is because of the use of different genetic groups of animals. The meat of pigs administered linseed oil was characterized by lower values of the b* parameter and higher values of the a* parameter (P <0.05) in opposition to other experimental groups. Ham made from LII was characterized by lower saturation of red colouring (a*) (P <0.05). Diet LI resulted in a decreased content of ash (P <0.05), an increased value of the b* parameter (P <0.05) in the raw meat, and decreased fat content (P <0.05) and increased protein content (P <0.05) in the ham. Diet LM had no effect (P >0.05) on the values of those parameters. Compared with the control group, pig diet LII decreased the content of connective tissue (P <0.05) in raw meat and improved tenderness (↓ WBSF) of raw meat and smoked ham (P >0.05). The differences observed in raw meat quality between groups (LI and LII) were limited to a higher content of ash (P <0.05), a higher value of the b* parameter (P <0.05), a lower content of connective tissue (P <0.05) and a lower value of the a* parameter (P <0.05) in meat from LII. Smoked ham made from the meat of the fatteners from group LII contained more fat and salt, but less protein (P <0.05) than that produced from the LI fatteners. In addition, the higher dose of linseed oil contributed to greater tenderness (P <0.05), a lighter colour (↑L*; P <0.05) and lower values of a* and b* colour parameters in the smoked ham. The yield of the processing was highest in meat from fatteners administered (LII), compared with meat from fatteners in groups C (P <0.05) and LI (P <0.05). It is difficult to have a comparative discussion about the effect of diet supplementation with linseed oil on the yield of the technological process and quality of smoked and scalded pork ham because of the lack of published data. Raw meat from the pigs fed diet (R) had a lower water content and contents of ash and connective tissue (P <0.05) than the meat from diet C. Diet R contributed to higher values of the b* parameter regarding meat colour, but had no effect on the values of the L* and a* coordinates (P >0.05). The smoked ham produced from the meat from pigs in group R was characterized by higher pH value, higher contents of water and salt and a lower fat content (P <0.05). In addition, it was more tender (P <0.05) and its colour was lighter (↑L*), but was less saturated with red (↓a*) and yellow (↓b*) colouring (P < 0.05), compared with ham from pigs that did not receive the R additive (P < 0.05). Compared with fatteners whose diets were supplemented, regardless of supplementation level, the raw meat of fatteners fed the diet supplemented with R contained less water (P = 0.039), but more fat and connective tissue (P <0.05), and was characterized by a higher value of the b* parameter (P <0.05). In addition, compared with the LII, the diet supplemented with 3% R resulted in decreased protein content for the raw meat (P <0.05), but caused no reduction in the protein content of the ham. 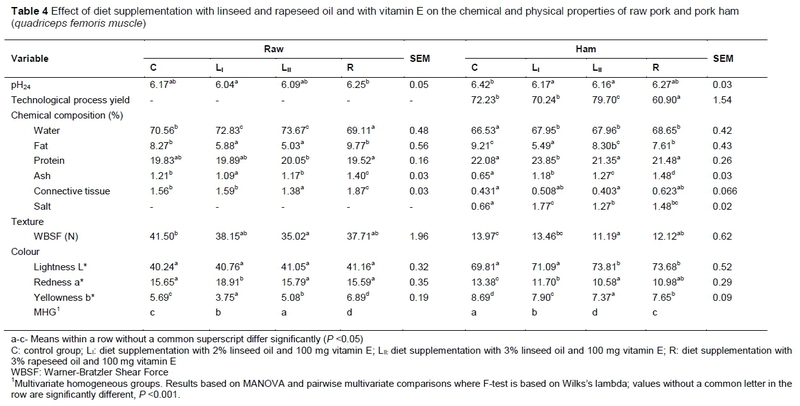 In contrast, linseed oil addition in a dose of 2% had no effect on the protein content in raw meat, but caused a significantly lower protein content in the ham (P <0.05) compared with R 3%. The yield of the processing was lowest in the meat from fatteners whose diet was supplemented with 3% R, compared with the meat from all other experimental groups (P <0.05). Rapeseed contains 36% to 40% fat and oil, which, when added to diets, increases their energy value and, simultaneously, is a carrier of glucosinolates, which disturb the functions of the thyroid gland through their negative effect on iodine metabolism. Exceeding the content of glucosilanes in a feed in a dose above 2.5 mM/kg feed reduces daily bodyweight gain, especially for younger animals weighing 30-60 kg. On the other hand, this dose of glucosilanes causes significant increase in the weight of internal organs, mainly the thyroid, liver and kidneys, which results in lowering thyroid hormone concentration in the blood. Those disorders may lead to inappropriate conformation of the half-carcasses, with their excessive adiposity caused by a reduced growth rate, and to a significant increase in the energy value of the diet (Schöne et al., 1990). The results of MANOVA and a pairwise comparison of the feeding groups are presented in Table 5 and Figure 1. The multivariate analysis demonstrated that the four groups of pigs did not differ significantly (P <0.001) in the quality traits of raw meat and the processed product. The greatest distance to group C was noted for group R in raw meat (D2 = 27.0) and smoked ham (D2 = 64.8). If all the traits are considered, the most similar result to the meat of the control was the raw meat of pigs fed a diet supplemented with LM (D2 = 11.9). In smoked ham, the most similar result came from the product made from the meat of pigs fed a diet supplemented with L (D2 = 32.6). Of all the groups, the least total difference was demonstrated between the ham produced from the meat of pigs from groups LM and R (D2 = 32.6), and the greatest between the ham from pigs from groups C and R (D2 = 64.8). The most beneficial effect on the quality of raw pork was observed with supplementation at L as it resulted in the lowest content of fat, the highest content of protein, and the lowest firmness of meat compared with meat obtained from all other dietary treatments. The highest technological yield of the product from the meat of pigs from group LN suggests it would be the most desirable by the meat industry. The high fat content of ham may be unwanted. However, because fat is the main carrier of flavour, its high content in the finished product may be preferable to consumers. In addition, the higher content of fat had a considerable effect on the increased tenderness of LM ham. Based on these results, it may be concluded that the least beneficial type of pig diet supplementation is the addition of 3% R. The meat of pigs fed this diet had a high content of fat and a low content of protein and generated the greatest losses in the processing of smoked ham production. High weight losses would contribute to a significant increase of the price of the finished product, and the exceedingly low content of fat in this product, which was lost in the scalding process, would affect its taste negatively. Research was realised in a Project BIOFOOD - Innovative, Functional Products of Animal Origin, no. POIG.01.01.02-014-090/09 co-financed by the European Union from the European Regional Development Fund in the Innovative Economy Operational Programme 2007-2013 and research financed by Polish Ministry of Science and Higher Education with funds of Faculty of Human Nutrition and Consumer Sciences, Warsaw University of Life Science (WULS), for scientific research. Authors do not indicate any conflict of interest.